Another Reese Witherspoon Book Club success! So let me first just put this disclaimer here. I don't think this book will be a five star read for everybody. But it was for me. And I will tell you why. 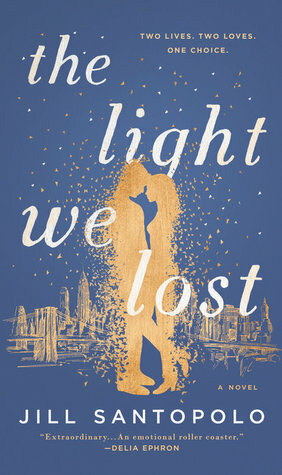 The Light We Lost is a beautifully written story about real life. Plain and simple. I felt like the characters in this story could have walked straight off the pages of this book and walked around today's society. They were flawed. They were real. They were honest. They struggled. I can't see how any man or woman who reads this book can't find something to relate to in one of the character's stories. The story is simply about a boy and a girl who connect on 9/11/2001. On that fateful day they find comfort in each other and are bonded to each other for life. Over time, they develop into an emotionally unavailable man whose mission is to make a difference after the events of September 11th and a woman who finds herself madly in love with him. His wanderlust takes him away from her, and as life goes on, she finds another man who makes her feel safe and comfortable, but doesn't ignite the passion of her first love. She finds herself asking whether fire, passion, and feeling alive with a "wild card" type of man are the key to a happy life or if the key is in the safety, comfort, and security of a man who provides stability and normality. I think we can all relate to that feeling at one point or another in our lives. Girls who go for the "bad boys" or chase after the wrong men for the thrill, while perfectly nice guys are waiting in the wings wishing they were being chased. That's an age old story. And if you haven't been there personally, you know somebody who has. There is nothing Earth shattering about The Light We Lost. It's not the world's most original story. Which is why I say it may not be a five star read for everybody. But, it was such an honest and raw depiction of love and life that I found myself making a strong connection with the main characters and their struggles. I honestly listened to this book in one sitting straight. It's a relatively short audiobook at around 7 hours (which took me 3.5 hours to listen to on double speed). While it is kind of depressing and sad, it would still make a good listen for a long car ride. I'm not a huge romance fan, but this is one that I would highly recommend. Sign into Goodreads to see if any of your friends have read The Light We Lost.